CODE WORD: GERONIMO, an original graphic novel illustrating the raid on Osama bin Laden’s compound by SEAL Team 6 on May 1, 2011. Expertly written by Captain Dale Dye (USMC, Ret.) and Dr. Julia Dye, Ph.D., CODE WORD: GERONIMO offers the amazing, moment-by-moment inside story of the clandestine raid that rid the world of this terrorist mastermind. 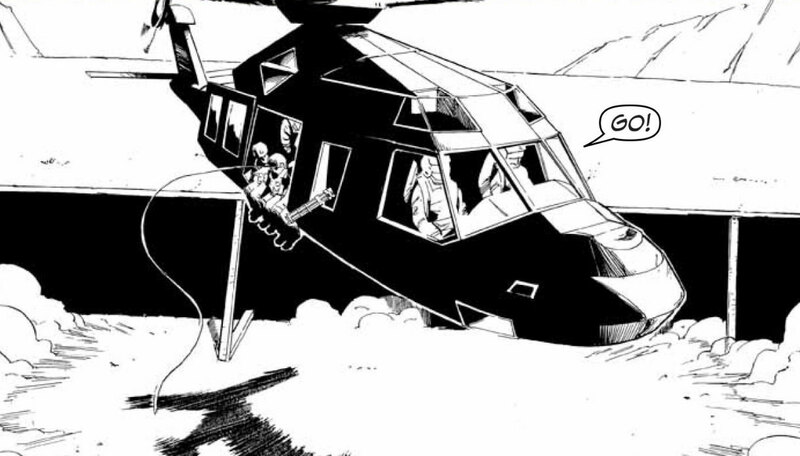 is that the illustration of the “mysterious” helicopter that crashed outside the compound ?? Is it just me or does it kind of look like there’s someone peeing out of that helicopter? That would be a pretty heavy stream. What’s next, a movie on it? I’d watch a movie about it lol. Seeing that the “story” was already written it would’ve been nice to this in color with more detail in the drawings. I believe the final version will have color. It says that on one of the webpages.